A map postcard showing an interesting view of Madison Wisconsin came in my mailbox from Eleanor. The only thing I previously knew about this city was that it is the capitol, has a university, and was named for President James Madison. 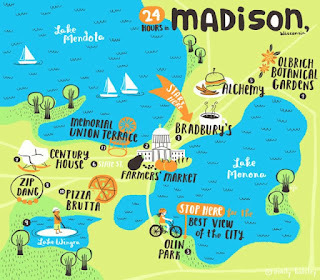 (okay, that last bit was a guess) But, as someone who loves maps and is a bit of a geek regarding urban planning, I was fascinated to discover that downtown Madison is built on an isthmus. An isthmus is a narrow strip of land that connects two other areas of land usually with water on either side. In this case, the water is two of the five lakes that are found in the city - Lakes Mendota and Monona. Yes, this city has five lakes! The others are Waubesa, Kegonsa and Wingra. With all those lakes come 13 beaches. And a bonus 260 parks. It is the creation of a local graphic artist, Lia Spaulding, who composed it according to characterizations gathered informally from an assortment of local residents. 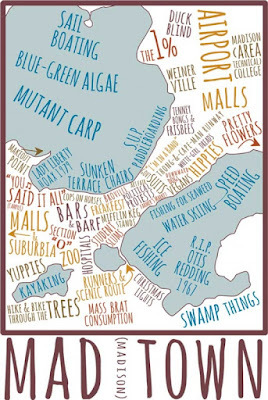 The “map” is an outline of the isthmus with labels superimposed, corresponding to different parts of the central city, walking a line on the funny side of stereotyping. Most of the image’s information is packed into the areas of campus, Capitol Square, and the near East Side. The Williamson-Marquette neighborhood is labelled “vegans,” “downward dogs,” and “hippies.” “Art fair,” “farmers market,” and “political protests” cover where the capitol sits. The neighborhoods where the majority of people of color in Madison live, on the South and North sides, are identified by landmarks or seasonal festivals rather than types of people. The South-Central sector, over 50% of whose inhabitants are people of color, is labeled “hospitals,” “runners & scenic route,” “mass brat consumption” (for the annual bratwurst fest) and “Christmas lights” (for the holiday light festival in Olin Park). “Duck blind” (the field where the Madison Mallards play), “airport,” and “Weinerville” (the Oscar Mayer factory) represent the North Side. Madison sounds like a fun and healthy place to live. Besides all those parks, there is an extensive network of bike paths and it recently was awarded a Platinum Status as a bike friendly community. (this makes it one of the five best biking cities in the country.) There are several museums – and a zoo – mostly free. And, it is less than 200km from Chicago and around 100kms from Milwaukee if you need more urban excitement. Plus, in light of recent events, it was also declared as the "least armed and dangerous city in the US" (Men's Health Magazine, 2008) In that year there were only 10 homicides. Anybody out there reading this who has been to Madison? Please do share your stories. Ah, the things you can learn from a postcard! and it's a fun way to learn! I have not. I'd like to visit, but too cold in the winter for me to live there. Very interesting. I like it very much.